Day Two of a 10-day hike…no trail, no boots, no turning back. ISKUT, B.C. — Gregg Drury is a Minnesota-raised outdoorsman, social activist and eco-entrepreneur who ~ I discovered ~ has a lot to say about menstrual products. 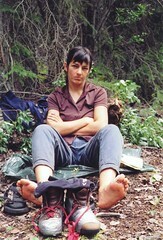 I’d agreed to join him on an exploratory section of his 60-day self-propelled Odyssey Tour and inquired ahead of time ~ as any inexperienced gal about to go hiking through northern B.C.’s grizzly country might ~ if it was okay to bring “Aunt Flow” along. 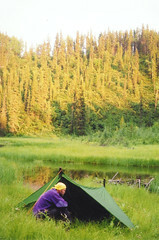 “Well,” I could hear him deliberate over the phone, “There is no doubt in my mind that a woman who is menstruating while on a wilderness trip increases the risk associated with a bear attack ~ both for herself and her travelling companions.” He went on to describe the dangers of conventional disposable tampons, the benefits of reusable menstrual cups and where in Vancouver I could get one. Simultaneously terrified and impressed, I made the necessary gear adjustments and met Gregg, assistant guide Fiona Brodie and fellow guinea pig John Harrison over topographic maps in Gregg’s Iskut, B.C. base about 320 kilometers south of the Yukon border. 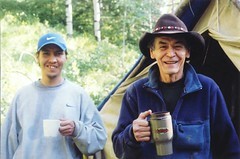 We’d be helped along by Tahltan elder Pat Etzerza, his nephew Clarence Quock, and five of their pack horses. Long before “amazing”, “extreme”, and “adventure” races became a reality, Pat’s ancestors regularly migrated between their winter hunting grounds in the Cassiar region’s Spatzizi Plateau and the summer fish camps at the confluence of the Tahltan and Stikine River. A 100-kilometer portion of this trail still exists, and Gregg lives about ten minutes away from its easternmost trailhead. He’s discovered that if you hike the old trading route to the Stikine and then paddle to its mouth, you can ocean kayak south down Alaska’s Inside Passage past Wrangell and Ketchikan, tuck into the Portland Inlet and paddle northeast up into Stewart. From there you can access Highway 37; cycle back into Iskut and have yourself one hell of a tour. He’s completed the 1,600-kilometer circle route a couple of times and can’t see why others wouldn’t want to try it too. “With all that gear?” I asked, half joking. “Oh, those horses are strong, full of vinegar!” he said by way of reassurance, “They can carry moose meat, horns and cape ~ 500 pounds worth”. One of the reasons Gregg brought Pat and Clarence on board, he told me later on the trail, was to offer them a different way to make a living than catering to fly-in trophy hunters. Despite our earlier efforts to surround ourselves with the grizzly-repelling smell of smoke and fire, I was oozing the scent of blood with no freakin’ menstrual cup to stopper it. I managed to macgyver two safety pins and a Kendall “Tendersorb” bandage into a makeshift sanitary pad, but I was not feeling solid about the 19 kilometers slated for the next day. Pat had warned us that there was “a little trouble with beavers” in the area and as we joined the side of the Klastline River, it became clear that our trail was in fact completely washed out. Smooth beaver chutes dropped into the wide river terraced by serpentine, 150-meter long dams. We were obliged to traverse a steep slope of scrub willow and birch. As towering poplars gave way to lichen-covered pillows of wet, spongy moss the terrain became flatter but denser. Feeble with menstrual cramps, I was losing a battle to push through the dense webs of stunted willow branches. I called out to Gregg, Fiona and John and we formed a huddle as the gloomy skies opened to a cold rain. “I’ve got my period,” I admitted wearily, “The cramps are pretty bad and I’m running about 75 per cent power right now. Plus…” I held up my foot, “My soles are falling off.” The rubber soles of my ten-year-old Raichles had peeled away from the toes like a ridiculous clown shoe. It was Day Two of a ten-day hike. There was no duct tape, no trail and no turning back. Gregg had been hanging back, either to offer moral support because I’d gotten repeatedly stung by wasps plodding over stump roots in his oversized gumboots; or because I was still a bleeding liability at the back of his herd. As euphemistically as I could, I explained that I was “having challenges” with the menstrual cup and had fallen back on a stash of O.B.s. When I confessed that I had been burying the used ones, he looked betrayed. He said something about burning them in the Trekstov ~ the one we cooked our meals on ~ but my mind was elsewhere. With each sloppy step, coin-sized blisters burned between my toes. The horses had passed and were hours ahead of us, and sheer stubbornness pushed me forward. I began to imagine myself loaded on one of them ~ not astride, like a human being ~ but draped, like one of those moose carcasses. 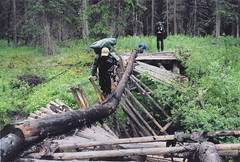 In the next four days, we navigated two derelict bridges, zip-lined one swollen river, and walked endless buckling, boggy, mosquito-thick kilometers. During the day Gregg, Fiona, and John offered mute support while I stumbled clumsily. In the evenings Pat and Clarence served up warm solace by their barrel stove. “Do ya think you could ride one of them horses?” Pat asked me one day over Spam and chicken soup. We were sitting at Creykes Camp, a cached clearing carved out of the Buckley Lake shoreline by Pat’s “relatives”, as he put it. Beyond the warm green glisten of the lake, the volcanic cone of Mount Edziza ~ named after Pat’s family ~ glinted white against the warm, rustling July sky. Gregg, Fiona and John had gone up to the mountain’s nearby Eve Cone for a day hike and Clarence was down at the dock fishing for rainbow trout. I was left with Pat to recuperate and prepare for the last portion of the trip. I looked up at him, and for the first time in a long time, I started to laugh. Except for the few months that the Iskut band brought them in for hunting trips, it turns out the the half-Clydesdale, half-wild “pack horses” usually ran unfettered in the boreal forest. Those animals were so smart, I’d seen them work their tethers loose and ~ hobbled and cow-belled ~ silently sneak away from Pat’s wall tent. A day with the horses meant I’d be expected to sit on the back of one of these beasts and help keep it from bolting the pack line when it had half a chance. It also meant I’d share the last 25 kilometers of the Tahltan’s ancestral trail with Pat, Clarence, and all their relatives before us. Published in the May/June 2005 Outpost Magazine.